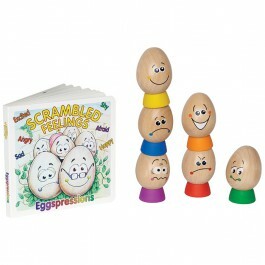 Unique wooden egg heads help children learn to identify and express their feelings in a fun way. Expressions include happy, sad, angry, excited, afraid and shy. Includes a story book about Humpty's cousins and how they are invited to a party but need a plan to get over the wall. By sharing their feelings and working together they find a happy solution.